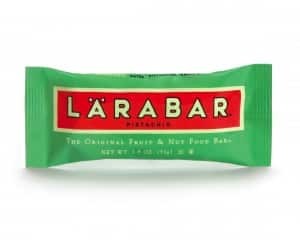 Click here to visit the Larabar site and fill out the easy form to enter their sweepstakes. There will be over 1,000 winners. There’s a limit of 1 entry per person, but you’ll have until 5/31 to enter. Good luck! 1 customized, single-speed FELT bicycle. 15 tote bags filled with 1 water bottle, a 15-ct box of full-sized LÄRABAR über bars, and 4 full-sized mixed flavors of LÄRABAR bars. 20 Donations to Make a Hero. 25 15-ct boxes of full-sized LÄRABAR über bars. 30 Water bottles with 4 full-sized mixed flavors of LÄRABAR über bars. 930 full redemption coupons for 1 full-sized LÄRABAR bar.